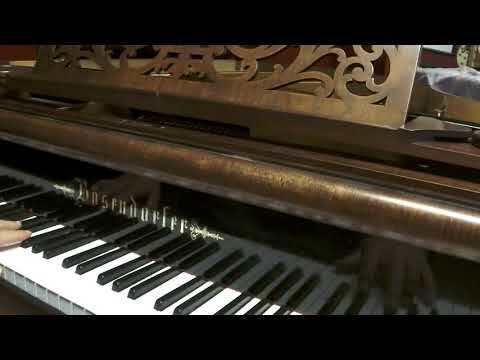 Gorgeous Restored 1898 Bosendorfer Grand Piano forte. This exceptional Pianoforte (183 cm/6’1), completed at the Bosendorfer factory in Vienna Austria in 1898, has been completely refurbished to full playing condition by the renowned Czech craftsman Julius Kulik. As an acknowledged world expert in antique piano restoration and lineage,Mr Julius Kulik work speaks for itself. Please review the attached photographs, which can only begin to demonstrate the luster of the fine German lacquers and beautiful hand-rubbed finish. To see and hear this piano is to learn about piano construction and the history of the world’s finest marque, and we encourage you to read on. Boesendorfers were built to stand up under the legendary hand of the man considered by many to be a defining force of the modern piano – Franz Liszt. The result of his relationship with the Bosendorfer company is a piano that performs like no other and the single escapement action, having been totally reconditioned with German components and carefully adjusted, is a pleasure. The hammers retain their leather cover, resulting in a strike that is not heard in the modern-day instrument. This grand old lady does not disappoint. Research from Bosendorfer into the background of this piano, the Serial Number , reveals that it was originally built for an aristocrat family in hungary .. During the refurbishing, great care was taken to recover not only the auditory and visual beauty which was so striking in youth, but also to preserve wherever possible the historical details which make this unique instrument so special. Due to Mr Julius Kulik’s considerable experience in restoring this and older pianos from Bosendorfer, Steinway, Bluthner, and many other less-familiar brands, including a great deal of work for various museums, his love of the instrument and skill as a craftsman truly shines through.